In this fascinating work of historical fiction, Pulitzer Prize -- winning author Lawrence Wright captures all the gripping drama and black humor of Panama during the final, nerve-racking days of its legendary dictator, Manuel Antonio Noriega. It is Christmas 1989, and Tony Noriega's demons are finally beginning to catch up with him. A former friend of President Bush, Fidel Castro, and Oliver North, this universally reviled strongman is on the run from the U.S. Congress, the Justice Department, the Colombian mob, and a host of political rivals. In his desperation, he seeks salvation from any and all quarters -- God, Satan, a voodoo priest, even the spirits of his murdered enemies. But with a million-dollar price on his head and 20,000 American soldiers on his trail, Noriega is fast running out of options. 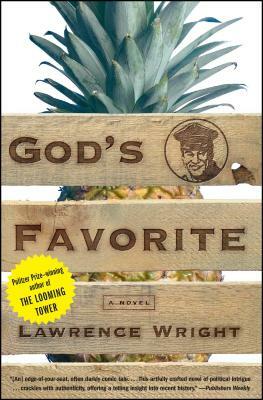 Drawn from a historical record more dramatic than even the most artful spy novel, God's Favorite is a riveting and darkly comic fictional account of the events that occurred in Panama from 1985 to the dictator's capture in 1989. With an award-winning journalist's eye for detail, Lawrence Wright leads the reader toward a dramatic face-off in the Vatican embassy, where Noriega confronts his psychological match in the papal nuncio. "Savvy and bleakly comic....A vigorous full-dress satiric farce that neatly skewers the self-righteous mendacity of all the Americas, ours very much included. The wittiest political novel we've seen in some time." "Wright is a gifted journalist who paints his characters in vivid pictures with just the right details for each." "Brilliantly fictionalizes Noriega's fall from grace." "A deliriously weird portrait of General Manuel Antonio Noriega...[as] both crazed and oddly sympathetic, a kind of Central American Tony Soprano." "[An] edge-of-your-seat, often darkly comic tale....This artfully crafted novel of political intrigue...crackles with authenticity, offering a telling insight into recent history."